Pretty nice getting to test ride all those bikes. I've found my perfect bike for the foreseeable future. The Valkyrie is smooth, quiet, and great handling (for a cruiser, I have no idea about sportbikes). Needed a windshield for hwy riding and a little plushier seat but really this bike does everything well and that's what I needed because I can't afford to have multiple bikes. I get the same, or even slightly better gas mileage than the m50, but it has a bigger tank so I get more range. The Kawasaki W800 is a very good clone of the Triumph Bonneville (or the 800+ cc version) but with better quality. I loved the paint scheme, green bike with a fade to cream on the tank. However the seat was too high for me, just like the Bonneville. I'll try to find a post I made on another site and copy it here. This was probably 5 years ago now, I think I was one of the first to ride the W800 in New Zealand as the Kawasaki demo days I had it on were the first since the bike had arrived, I think I rode it before any journalists. I understand that the W800 has been discontinued now. I've been very lucky in my relationship with my local bike shop. They've looked after me since I first started riding my Hyosung GV250 learner cruiser a year ago. When I dropped in to tell them that I'd passed my full license just a few weeks ago, they arranged for me to have an extended ride on their demonstration Hyosung ST-7. Then, a few days later, Dave told me that Kawasaki were bringing six demonstration bikes down for three days of test riding, and that he had arranged for me to have the new Kawasaki W800 for an trial ride while it was in town. The biggest problem I had when first seeing the Kawasaki W800 is deciding where it fits into the wide world of motorbikes. It really does look as if it's come directly from the 1960s. Wire spoked wheels, chromed metal mudguards, instruments mounted above the handlebars, rubber knee pads on the tank, a rather flat seat, air-cooled parallel twin, chain drive, and a rear drum brake. As a modern interpretation of the classic bikes of the 60s there are a couple of modern touches, such as fuel injection and a digital odometer. The engine is a thing of beauty, the fins taper inward as they go down the cylinder, the cylinder head is large and there is a chromed tube going up the outside of the right hand cylinder that carries the camshaft drive. And the bike is done in a paint job beyond belief, a dark metallic green which fades into a pale panel on each side of the fuel tank. Apparently the W800 is referred to as a “retro classic”. And it's mine overnight, from close of work Tuesday night until eight o'clock next morning. As soon as I sit astride the Kawasaki W800 I feel that this isn't really be the bike for me. I am not the tallest rider in the pack, I'm only 1.70 metres (5' 8”) tall. I could also be rightly described as being challenged in the area of my inside leg measurement. The seat height of the Kawasaki W800 is 790 mm (that's 31 inches in the old measurements). Once astride the W800, I can only touch the ground with the tips of my toes. As well, the Kawasaki W800 is fitted with both a side stand and a centre stand. With the foot pegs being further back than on a cruiser, the side stand seems as if it's been squeezed in between the foot peg and the centre stand. If ordering the bike, I think I'd ask that the centre stand be removed. The side stand seems adequate for all bike parking situations, and it would be so much easier to flick it down if the centre stand wasn't there. It's a hangover from riding a learner cruiser for the last year that I'm not at first completely confident with the position of the gear selection lever and the rear brake pedal. The foot pegs are further back than I'm used to. My feet are directly beneath my knee, not forward as on my cruiser. I felt that I have to point my toe down to get it under the gear selection lever and that the rear brake pedal seems to be below the level of the foot peg instead of above and forward. However after a few minutes I've got used to the new position of the foot pedals and find it is easy to go down through the gears as I slow down for my favourite exit and to work my way back up through the gears again as I ride up through the string of roundabouts on my "long-way" home. This is great, once I've got my feet off the ground and onto the foot pegs I'm seriously having fun. I'm not having any trouble with the narrower handlebars on the W800. They are a lot narrower than I'm used to, but I have no problem easing the bike over. It seems as if it just glides through the corners. I don't seem to need to lean it over as far to go through the same corner at the same speed as I would on my learner cruiser. I also find that my upper body is leaning forward a couple of inches more than on my learner cruiser, but it isn't at all uncomfortable. But I am certainly having trouble with the mirrors. Kawasaki seem to have kept the rear view mirrors within the overall width of the handlebars. To check my rear view I am having to tuck my elbows in. I'd look at fitting after market mirrors or mirror extensions if this bike was going to be parked in my garage. I also notice the noise of the camshaft bevel gear drive, at first I thought it might be the noise of the chain, and I'm not sure if it would annoy me or not. I'd like a little more noise from the exhaust though, but I'm sure that could easily be arranged. At 6.30 next morning, as the clouds over the eastern hills were starting to colour with the rising sun, I'm heading out of Tauranga on my way towards the Kaimais. Down at Tauriko the road is dry and I ease through the first corners. But the wind picks up as I climb and soon the road is dark from rain which has fallen overnight. The wind doesn't seem to be blowing me around on the road though. I feel quite stable on the bike, even when coming out of a cutting and feeling the full force of the wind. Further up, the road is actually damp and the first trucks coming down towards the port are throwing quite a bit of spray up onto my visor. It looks as if there is low cloud ahead over the summit, low cloud with rain in it. And I'm riding somebody else's bike. So I turn around and head back down the road towards the city. After another ride around my favourite city jaunts, I take the W800 back to the it's rightful owners. So, what do I think of my first ride on a non-cruiser, on this retro classic. Well, the riding position is different, but easily adapted to. The flat seat is comfortable, in fact it's easy to find the right position on the seat and to stay there. There's performance in the air-cooled 773 cc engine too, more than I am used to anyway. I had to keep a careful eye on the speedo to avoid the possibility of making an unwanted contribution to the Government's coffers. But the rear view mirrors didn't give an easy view behind. I felt as if I was having to tuck in my elbows, just like doing the chicken dance, in order to get a view of what might be coming up behind. I'd be looking at fitting wider after market mirrors if this was my bike. So, could I live with this bike? Because of my short legs, this retro classic is unlikely to loom large in my riding future. Platform soled riding boots just don't seem to be the likely answer to my lack of height. But for a taller rider who already owns a leather jacket and an open face helmet, this would be a great bike. It's a fantastic looker, easy to manouver through city traffic, and really enjoyable on the open road. Some of the time that I had riding the W800 was a bit miserable, windy, and with the likelihood of rain. But I had fun. And that's the bottom line isn't it? But I had fun. And that's the bottom line isn't it? Yes. Alas I don't personally find it fun to read long rambling posts. It's a personal problem of mine. I hope others find it interesting. There was no need for you to make that comment. It added nothing to the discussion. Problem is that his post didn't feel much like a discussion. I probably should have handled it differently. And you could have too. Boulevardier: Sorry man. Keep up the good work. Last edited by Easy Rider; 09-06-2016 at 08:37 AM. I ride a 2016 C90T all blacked out version today, but have had many bikes over the years. Though I have to admit, I have never owned a Harley. No particular reason, as they are beautiful machines, but just never happened. to the forums from Arkansas. nice looking machine,enjoy!!! Thanks Boulevardier that was helpful and a good read. Since my riding started in the 60s I'm partial to bikes from that era and the new retro copies and I like learning about their performance. 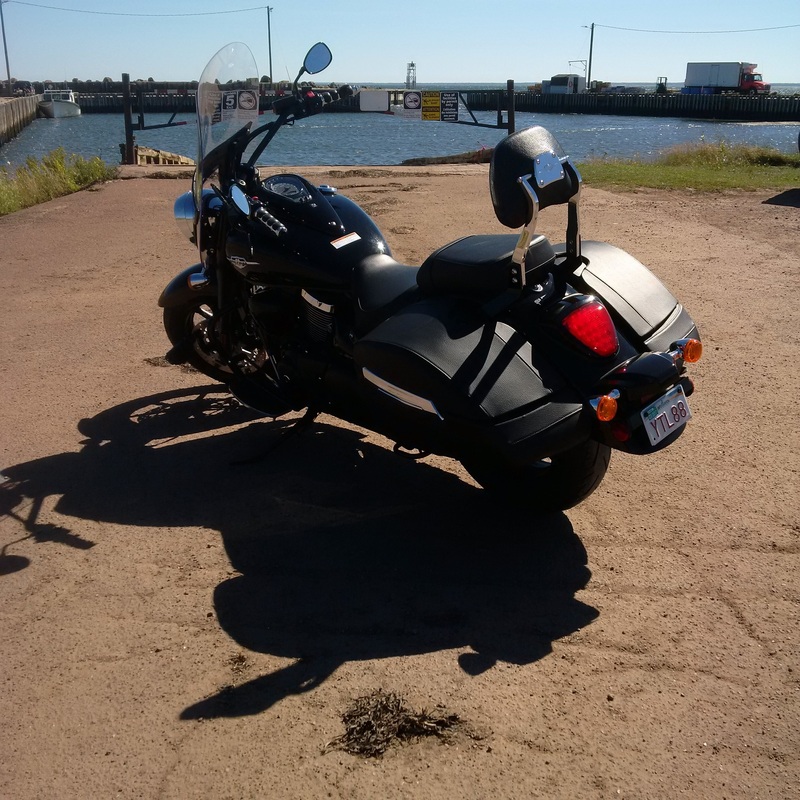 Just bought a 2007 boulevard m50 with 3700 miles. I haven't had a bike in 15 years. I bought my first bike three weeks ago, at age 60. An S40. Welcome and your never too old to try something new! Hope you really enjoy it! Who else has a Honda CBF600SA ?